Do you need to repair a corrupt Microsoft® Excel spreadsheet? When you try and open the file, do you get an Excel spreadsheet error message? Are you unable to open the Excel workbook? If the Excel file does open, does it show errors, not work properly or appear to be corrupt? 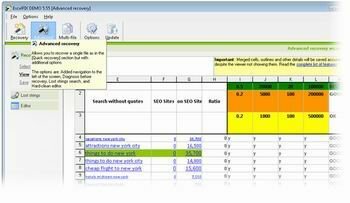 Do you need to get back corrupted Excel spreadsheet content, elements and formulas? In cases such as those above, we recommend ExcelFIX as one of the best programs to repair and recover data from a corrupt Microsoft Excel file. 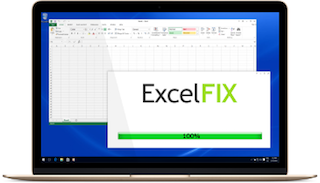 The free ExcelFIX demo version provides a preview of the repaired file on-screen and allows you to select sheets, scroll and view formulas interactively so you can see how effectively your corrupt Excel file has been repaired before deciding to purchase. There simply is no risk. With ExcelFIX there is no need to send your files to an unknown third party for recovery. ExcelFIX works with Microsoft® Excel 95, 97, 2000, 2002 (XP), 2003 and 2007. ExcelFIX is a long established, well developed product resulting in a fast, good quality, reliable and easy to use solution. ExcelFIX recovers all formulas, names, external references and multi-sheet ranges in an Excel file. ExcelFIX recovers all types of values including texts, numbers, dates and hyperlinks. ExcelFIX recreates accurate cell appearance. ExcelFIX recovers and preserves fonts, borders, colours and patterns just as in the original Excel file. ExcelFIX also recovers merged cells. ExeclFIX is one of the few solutions that will correctly recover group and outline elements, subtotals, page breaks and print settings. ExcelFIX is fast and can complete the recovery and repair of large spreadsheets very quickly. 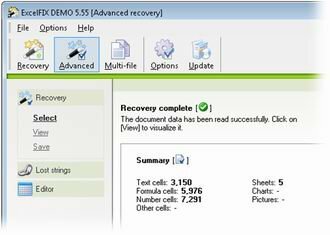 Confidence – The free evaluation version of ExcelFIX lets you see if it is possible to successfully recover and repair your corrupt Excel file in the first place at no cost. The evaluation version provides an on-screen viewer so you can see detailed results of the recovered spreadsheet before you decide to buy. The ExcelFIX demo allows you to select sheets, scroll and view formulas. You can see for yourself whether the product will work on your corrupt Excel file before having to purchase it. Qualified support – Purchase the software and you get personal, qualified support direct from the manufacturer if you need support or assistance. Virus-free and spyware free – ExcelFIX includes a digital signature that will confirm its true source. You can check the signature by right-clicking on the installation file and selecting the option Properties. Non-Destructive – ExcelFIX does not modify the original Excel file in any way. This guarantees that there will be no further damage to the file. An established solution – ExcelFIX is part of the OfficeFIX suite of corrupt file repair tools, developed over more than eight years. This experience has allowed the development of ExcelFIX to cater for the recovery all types of file damage that can occur in an Excel spreadsheet. Comprehensive – The advanced and complex reverse-engineering techniques used by ExcelFIX to repair corrupt Excel spreadsheet files means that only with ExcelFIX are you sure to have recovered all the elements and the important details in the file. Click Recover and let ExcelFIX get to work on your corrupt file. You will shortly see a summary of the repair operation. repaired spreadsheet within the preview window. you will then need to purchase the full version of the software to save the repaired file to disk. We hope you are able to recover and repair your corrupt Excel file.